Most themes these days are stuffed with excessive features and needless scripts and it is hard to narrow down some of the truly minimalistic and simple themes. Our collection of the best minimal one page WordPress themes should help make that task easier. Looking for a clean, simple, minimal one page WordPress theme for your business or personal portfolio? Sometimes all you need is a quick, minimal, super clean website that is easy to set up and displays your information in a well-laid out manner. Most businesses looking for templates online do not have extensive feature requirements other than creating an information website that is well thought out, looks awesome, and performs well on search engines. The main aim of a single page website is to provide the user with enough information on the main landing page that he can act upon. This eliminates as much clutter as possible and showcases the most important content and highlights of your business that will attract the visitor’s attention and keep him engaged. Even though one page websites work best of product announcements, landing pages, promotions, portfolios, they are also a great tool to set up a business or individual’s website that does not have a lot of content. Since the one page theme aims to showcase most of the relevant content on the home page, the challenge is to display it in a manner that is not overwhelming, exudes simplicity, professionalism, and tells your story in a seamless manner. So the page focuses on quality rather than quantity – and hence the message you’re trying to portray gets simplified and sectioned off into different chunks that the user can navigate or scroll through. By carefully planning the sequence of the page elements, you can lead the user through your content towards the action you want them to take for example filling out a contact form, making a purchase, signing up for your newsletter. Here we’ve collected some of the best minimal one page WordPress themes that you can use to set up your website easily and quickly. Each link opens in a new window/tab so you can browse through the ones that look and sound appealing to make a final decision about the theme you’d like to use. 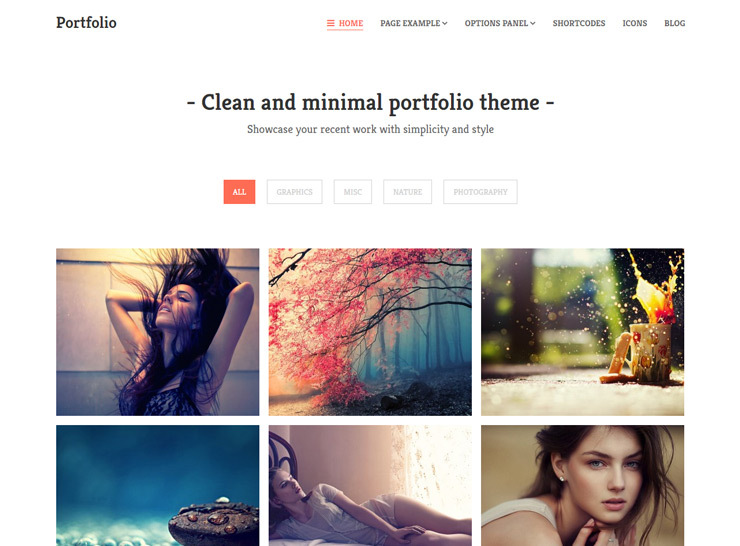 All these minimal one page themes require a self-hosted WordPress site. 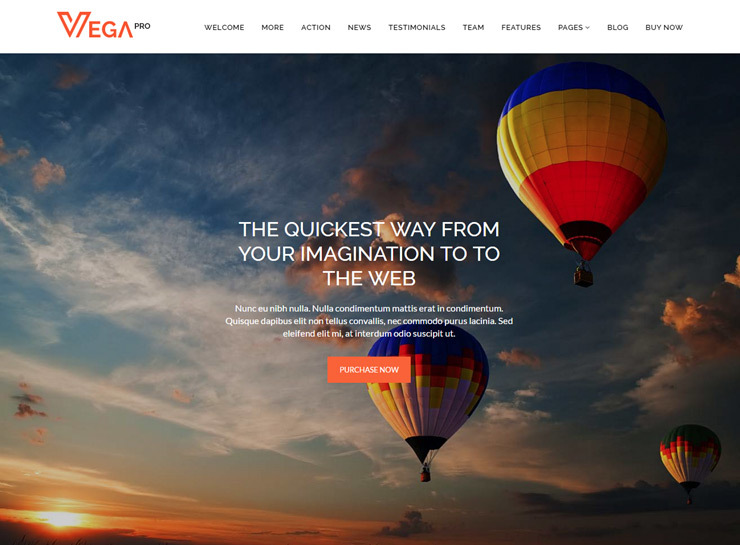 OnePage is a beautiful, well-crafted theme backed by stellar support that is fully customizable, and loads super fast. The home page layout can be controlled by drag and drop functionality. The theme comes with all the other pages if needed, such as pages with sidebars, multiple blog layouts, etc. It also has a parallax scrolling effect for some of its sections, creating a sense of depth for the users on your website allowing for a beautiful viewing experience. The slider can be controlled using the left and right arrow keys. The theme comes with some great animation effects and the top navigation floats at the top while the user navigates the page. The services section can have as many items as needed since it shows up as a carousel that the user can browse through. The theme comes with a contact form that is protected against spam submissions. The portfolio section is very well built with the project details loading on the same page right above the portfolio items grid. Key features of OnePage are: Hand crafted design, fully responsive and clean code, unlimited colors, clean code, fast loading, theme options, counter to show business statistics, team section, sliding services section, Twitter feed, portfolio section, pricing table, testimonials, clients section, one-click demo install, two blog layouts, spam protected contact form. 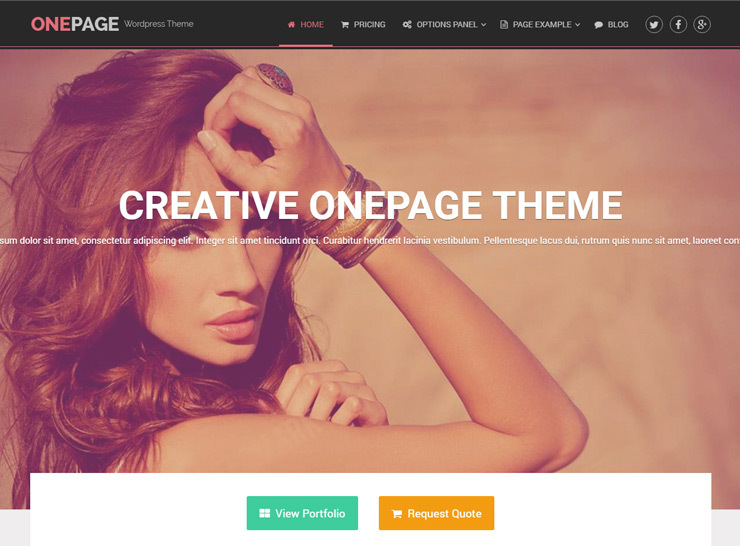 OneEngine is a multi purpose one page WordPress theme with a minimalistic yet bold design. It features some amazing use of color, and is a theme that can end up helping you creating a website with a lot of character and personality. The theme starts off with a simple slider and nothing else – putting your words and images in front of the user so you can get your main message across quickly and effectively. Scrolling down brings forward the main website, with the navigation sticking to the top of the browser window and several rows and sections containing different content to help you set up your website. After the services section which features some sleek icons, there is a parallax background row where you can optionally link to a video that opens in a popup window. An about section displays a timeline feature, the team section shows all team members in a carousel format, and the portfolio section can be filtered by project type. The pricing table design is also unique; the are shown in a circular fashion and really catch the eye of the visitor. The usage of color throughout the theme is well thoughtout and refreshing, since most minimal themes of this nature are mostly white, black, or blue! The testimonials section also sports a unique design, where clicking on the small client photos displays the testimonial for that client. A contact section with a parallax background effect is shown as the last row, with a contact form built using the Contact Form 7 plugin. Truly, one of the best minimal one page WordPress themes in the market today, OneEngine should suit your needs for a small business or individual website very well. Main features of OneEngine are: use of bold colors, fully customizable, unique design, shortcodes, blog layout, multiple page layouts. Juster is a strong multi purpose theme that comes with many pre-built layouts, one of which is a simplistic one page template. 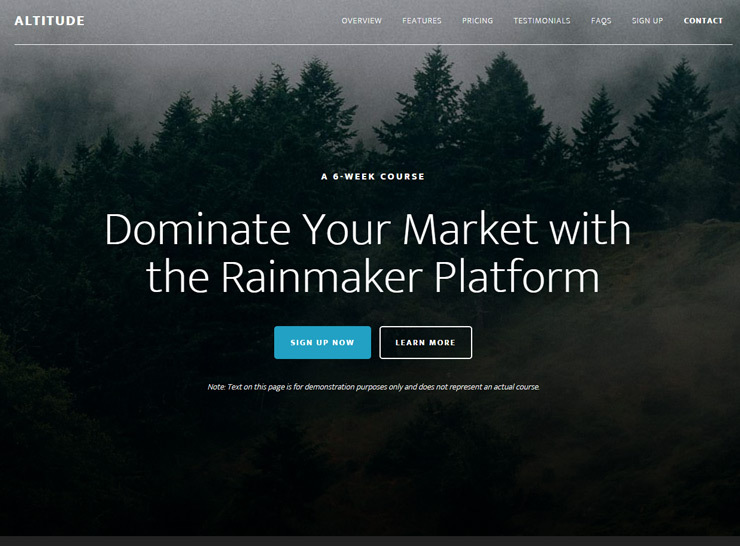 The page starts off with a stunning slider, and then goes on to display other content such as about us, portfolio, testimonials, pricing tables, portfolio items, latest blog posts, and a contact form. The theme’s strength lies in its many shortcodes and page layouts using which you can create an original website with colors matching your brand. 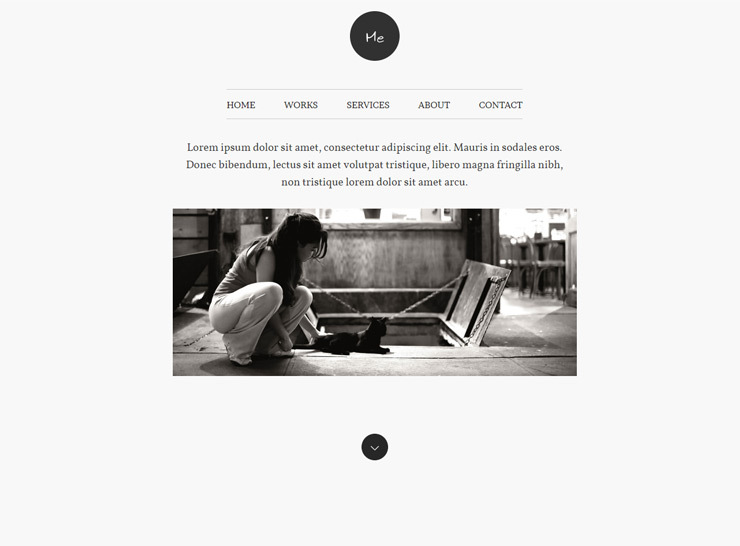 Me is a modern one page template that looks different from most creative WordPress themes. It is black and white, and has an elegant minimal style. 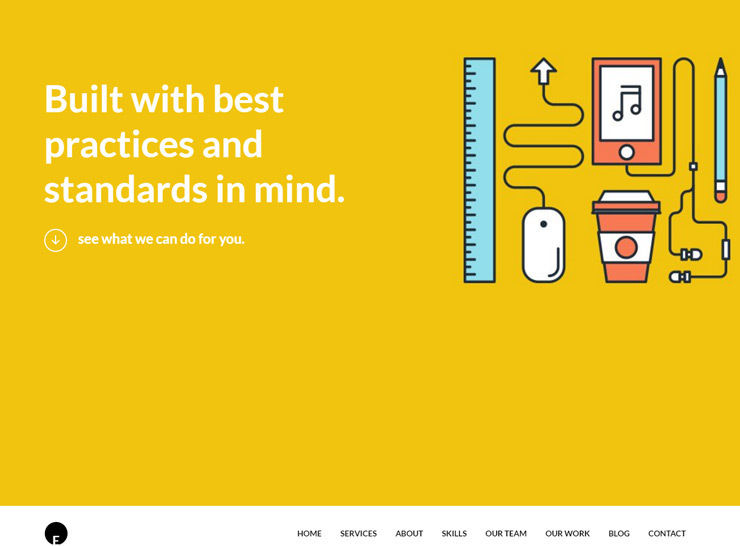 The theme boasts a lot of white space and somewhat narrow page canvas. It has big bold typography and its use of black and white will work very well for most websites. After a compact slider, the theme leads with the portfolio, then services and an about section, followed by a contact form. Main features of Me are: 70+ fonts, powerful portfolio system, filterable elements, translation ready, Contact Form 7 ready, custom AJAX form included. 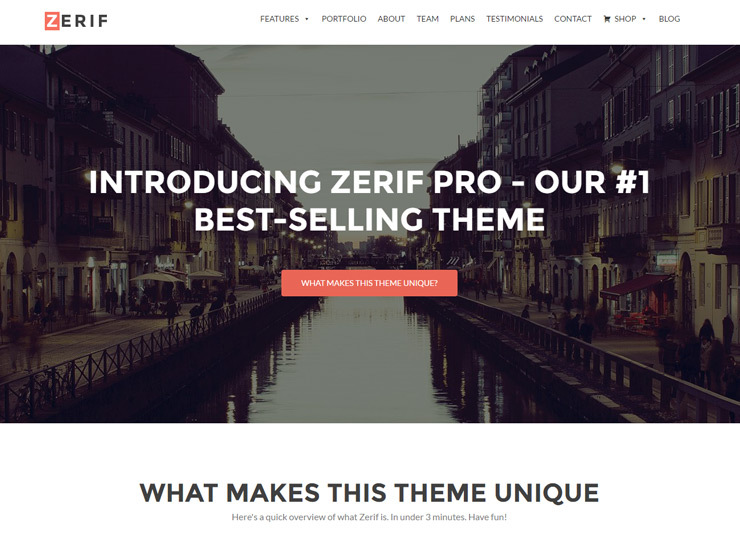 Zerif Pro is a well coded, widely used and highly customizable one page WordPress theme with a modern somewhat flat design. 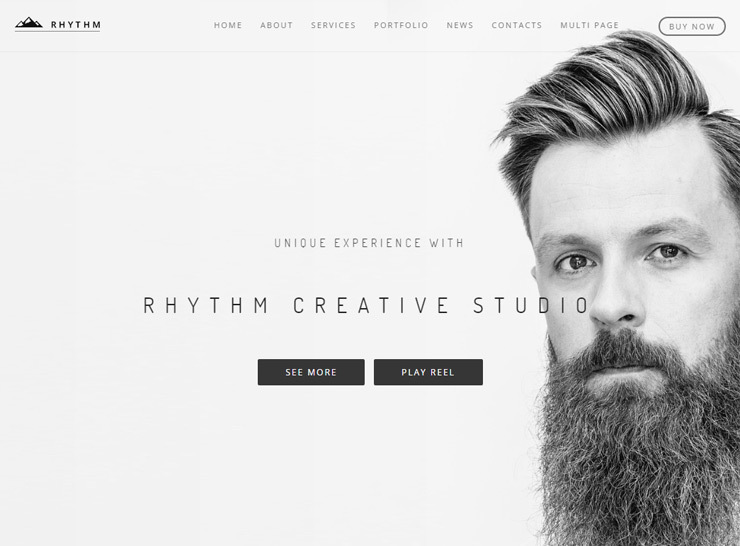 It is a modern and versatile yet clean and minimal single page WordPress theme well suited for showcasing your portfolio, or creating a business or individual’s website. While it is a one page theme (the front page can be set up as a single page with many sections) – it can also be used as a multi-page website since it has all the relevant templates for pages, blog, and an online shop using WooCommerce. The great thing about this theme is that it is flexible enough to be suitable for any kind of business and the theme options allow you to make it your own by changing colors and styling throughout. It’s clean and minimal design makes it suitable to be used for a variety of purposes. It’s home page has many sections such as portfolio, about, team, plans, testimonials, and a contact form. The theme is also WooCommerce ready so you are set to start selling your products or services online. Zerif PRO is translation and multilingual ready thanks to its built-in support for WPML multilingual plugin. Zerif Pro comes with a color picker so you can choose any color you want for the theme colors and match your website to your brand. Some key features of Zerif Pro are: translation ready, RTL ready, SEO friendly, live customizer, 1 minute setup and demo content, optimized for speed, custom backgrounds, mega menus, SiteOrigin Page Builder compatible, unlimited colors, theme options panel. Portfolio is a clean and minimal portfolio WordPress theme designed to help you display your creative portfolio or images in style. It comes with a huge library of custom widgets and all the features you need to showcase your portfolio and places the focus squarely on your work. With a fully responsive layout and a minimal look, the eyes are drawn to your beautiful content which is loaded on the same page using AJAX. Main features of Portfolio are: clean minimal design, AJAX loading elements, advanced portfolio filters, change number of columns and image sizes for portflio items, clean and minimal blog layout, 630+ Google fonts, social media integration, portfolio navigation, unlimited color options, mega menu compatible, unlimited background options, parallax blog posts, unlimited sidebars, translation ready, RTL support. AppTheme is specifically designed for showcasing mobile applications but it is versatile enough to be used for any business or creative portfolio. The theme is customizable so you can choose which sections to show users and in which order. It shows a large banner with call to action buttons when the page opens, and then goes through the features, a video of the product, screenshots, reviews, and a contact section. Like most one page WordPress themes, it also has a blog section that opens a separate page. Main features of AppTheme are: Simplistic design, customizable sections, large banner, featured video, and blog. 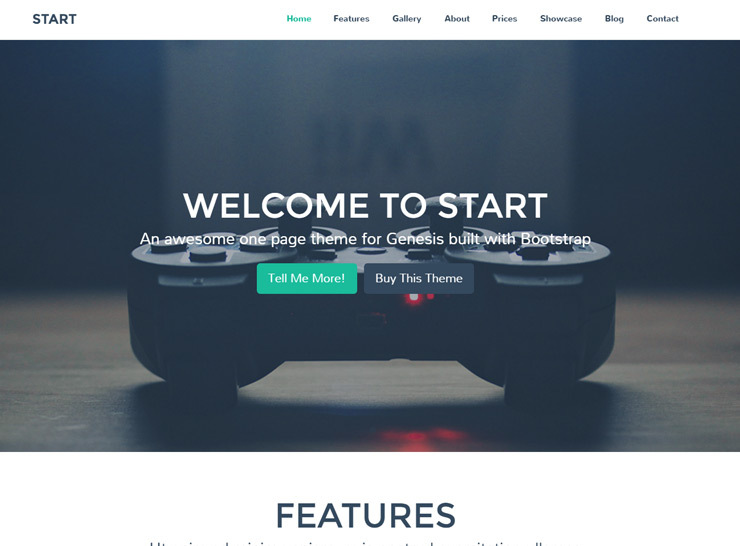 Start is a well developed multipurpose light weight but featured packed simplistic one page WordPress theme suitable for most kinds of businesses. It’s bold typography and light colors send a strong message and there is ample opportunity to showcase your work and content using this theme. The theme has a large slider at the top and then has different sections for displaying various kinds of content, such as features, gallery, about section, prices, work showcase, recent posts, and a contact form. Some sections sport the parallax background effect giving more character and depth to the overall look of your website. The contact form is accompanied by a large full width map at the bottom of the website that allows people readily to find your address and location. The outlook of this theme is a very solid, dependable company and with the customization features that accompany the theme, you can match it to your brand and colors. Main features of Start are: theme options, powerful code, localization ready, Genesis framework, parallax background, translation ready. Rhythm is the winner of an honorable mention on Awwwards. An extraordinarily stunning, aesthetically clean and provocative theme, it comes packaged with many different demos that can be installed with a single click. 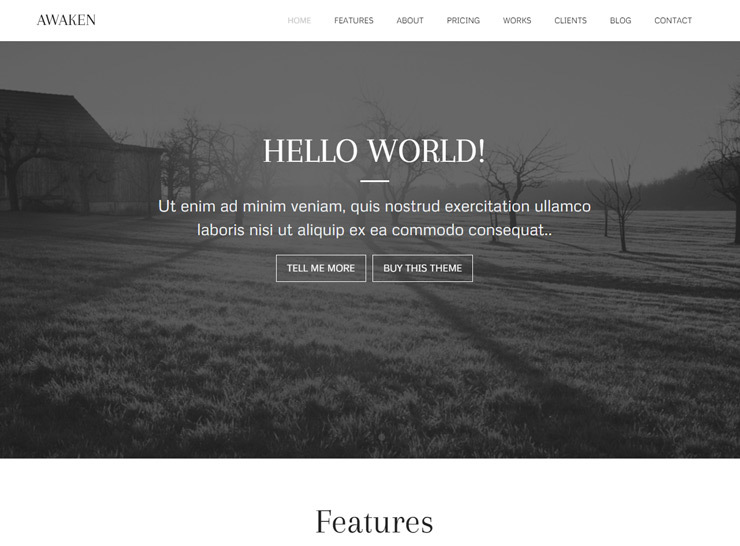 There are 21 one page demos alone in this theme that can be used as a starting point for your next website. 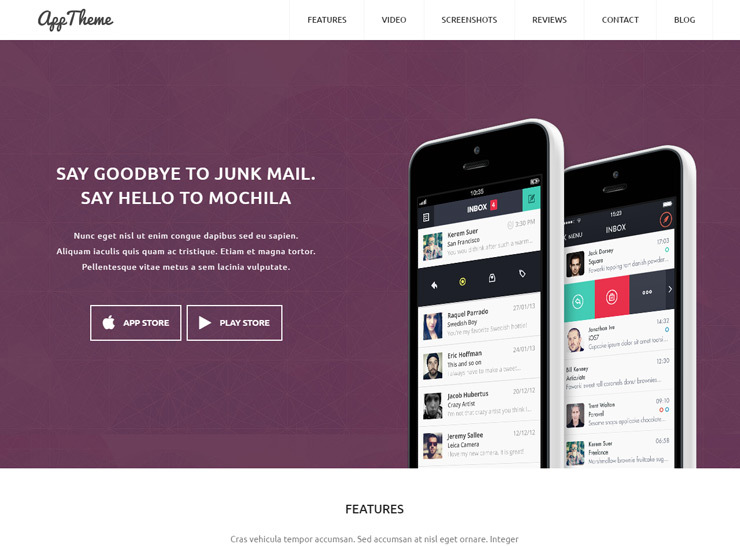 The theme has many different menu and header options, as well as light and dark themes. The many options and features in the theme allow you to build a completely unique website with drag and drop functionality. The one page layouts are clean and minimal and exude a class and character that will keep your users engaged for more. Meeting sports a simplistic look that was specifically designed for events, conferences, workshops, summits, meetups, etc. However, the theme is highly customizable and can be used for any time of website or business with a few clicks. The design is airy and beautiful and has many sections for the home page such as team or speakers, timeline, recent blog posts, statistics, pricing table, Twitter feed, Instagram feed, FAQ, sponsors or clients, and a video section. The light colors used in the design give you an opportunity to show off your content and images. 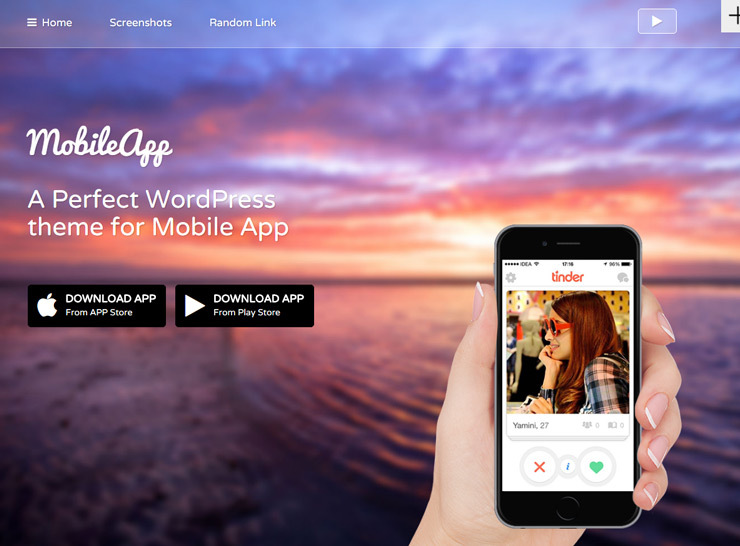 The theme is integrated fully with the Tickera plugin and has a one-click demo install that can be used to initially set up your website. As with most themes that have a single page home page layout, Meeting also comes with multiple blog and page layouts that can be used for other parts of your website. 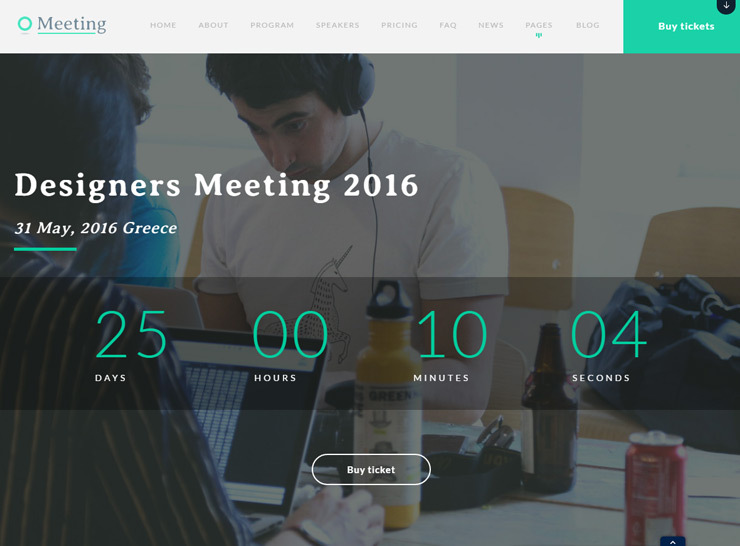 Some of Meeting’s main features: built-in shortcodes, demo data, theme options, Revolution Slider, Custom Visual Composer shortcodes, One page dynamic menu, Twitter feed, Instagram feed, Child theme friendly, Visual Composer, Event countdown, Tickera plugin integration, multiple blog layouts, subscribe form, one click demo data install, social icons. MobileApp is specifically designed for selling and showcasing a mobile app but the layout is flexible enough to be used for any kind of individual or business website that is looking for a minimal one page website. The home page can have unlimited sections with great placement of call to action buttons. There is a contact form that can be included as well as social media icons. The theme is very simplistic and showcases your main content beautifully. Main features of MobileApp are: animated text, animated mobile screens, redirect all pages to home page if needed, 6 different mobile choices to display your screenshots, header navigation controls, unlimited colors, scrolling or fixed parallax background images, unlimited backgrounds, custom CSS, unlimited buttons, contact form, unlimited sections, social icons, seo ready, translation ready, 630 Google fonts, one-click installation and import/export of settings, video popup, one click updates. Advent is a great looking landing page that is both simplistic yet modern with lots of opportunities to display different kinds of content in an appealing manner. 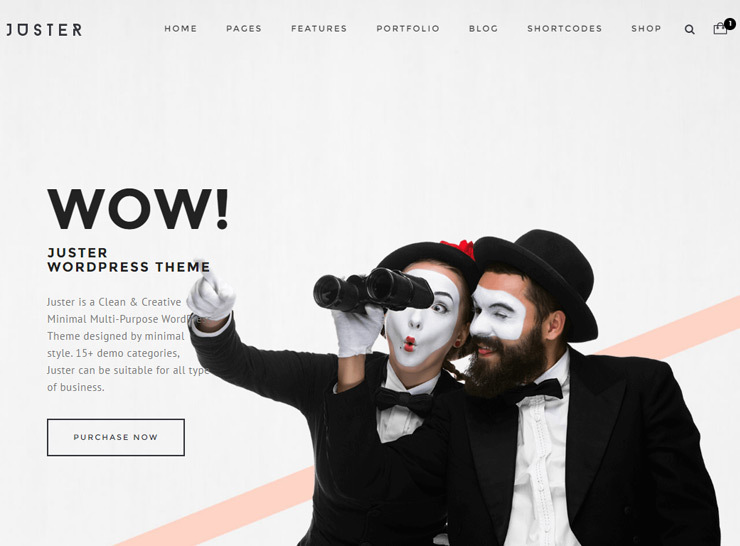 Don’t look further if you’re looking for a full featured simplistic and minimal one page WordPress theme that has all the bells and whistles to push your business or product forward. The home page sections comprise of features, overview carousel, services, screenshots, tesitmonials, pricing tables, team, and a contact form. The transition from section to section is very smooth and well balanced. The animations are sleek and not too overwhelming. Beautiful typography and a light theme make this a good choice to create a simple one page webiste. The theme is also capable of creating a multi-page website, and like most other single page themes it has different page templates and blog layouts. 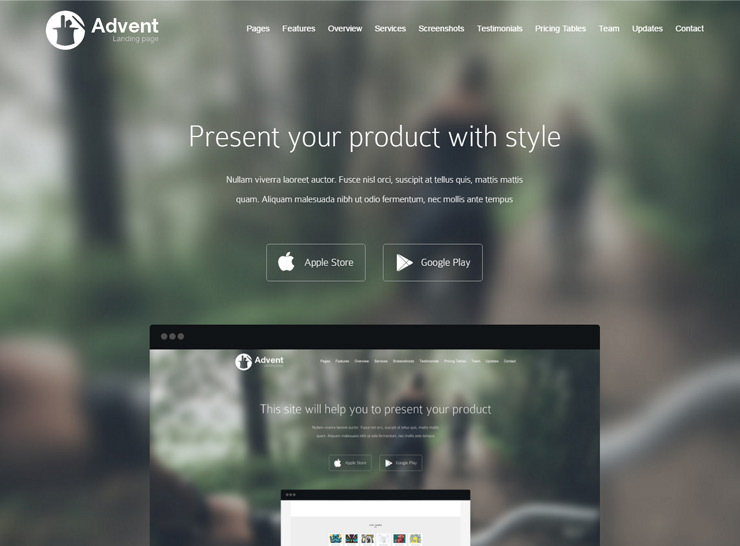 Main features of Advent are: sticky menu, Visual Composer included, pricing tables, magnifying glass for product images, social media integration, contact form, shortcodes, clean code, customizable typopgraphy, one-click demo data install, translation ready, Child theme friendly, Icon Fonts (3,000+). Awaken is a multi purpose single page WordPress theme built on the Bootstrap CSS framework that has a very clean, simple, yet trendy design. The theme can be easily used to create a landing page or a full fledged company website, and the airy and open design allows for an uncluttered, professional website. The theme sports a sticky menu and starts off with a slider. The features section can showcase services or main highlights of your business in 4 well designed and well placed columns. The call to action row shows off a parallax background image, followed by a section to display information about your team. The theme also comes with pricing tables, filterable portfolio or project images, testimonials carousel, recent blog posts, and a contact section. There are multiple parallax background rows that can be used to show quotes, call to action buttons, or just other prompts to convert the visitor. Main features of Awaken are: multiple parallax background rows, built on Bootstrap, slider, pricing tables, filterable portfolio, team, testimonials, contact form. Single has a unique design where it starts off with a big bold slider and show the main navigation after it. So you can put your main headlines front and center and have the user move to any of the main sales pages through the buttons and text on the main entry slider. Once you scroll down, the navigation moves up and sticks to the top of the browser as you go through the rest of the sections on the home page. After a welcome section with some text, you can showcase your portfolio that can be filtered by work type, show your team members, services, latest blog posts, testimonials, ending with a contact form. 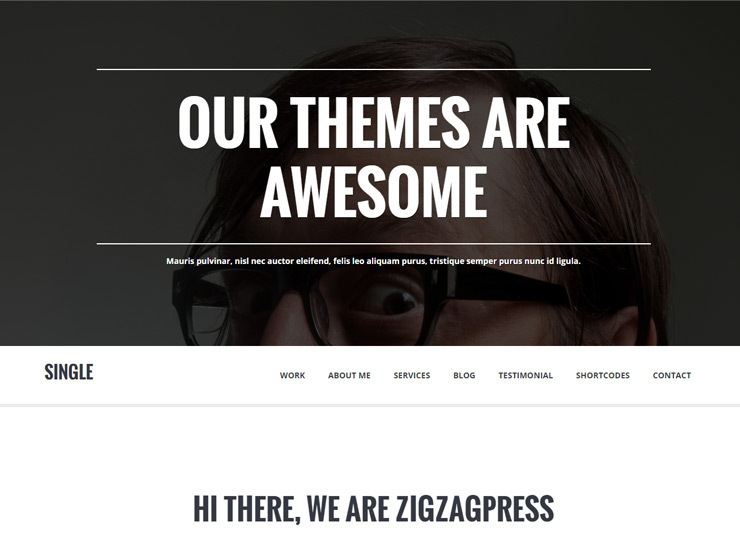 The home page sections can be built using the many shortcodes that come with the theme. The big bold outlook of the Single theme is exceptionally useful for making a statement with your website and the ease of use and setup of the theme allows you to create your website quickly without any hassle. The main features of the Single theme are: single page design, unique design with slider up front, sticky navigation, testimonials, team members, portfolio, latest blog posts, contact form, many shortcodes. Altitude Pro is a single page WordPress theme built on the Genesis framework and has an eye catching and attractive design that is simple yet effective. The theme starts off with a full width and full height image that takes over the entire page and is capable of showing a caption and a button that can link to any URL where you may want to lead the user. The next few sections give you a change to showcase your business or product highlights, with parallax background effects and well thought out image placement. Pricing tables, testimonials, FAQ, and a final call to action row complete the compilation on the home page. Main features of Altitude Pro are: eye catching design, Genesis framework, beautifully minimalistic blog layout, shortcodes, parallax background images. 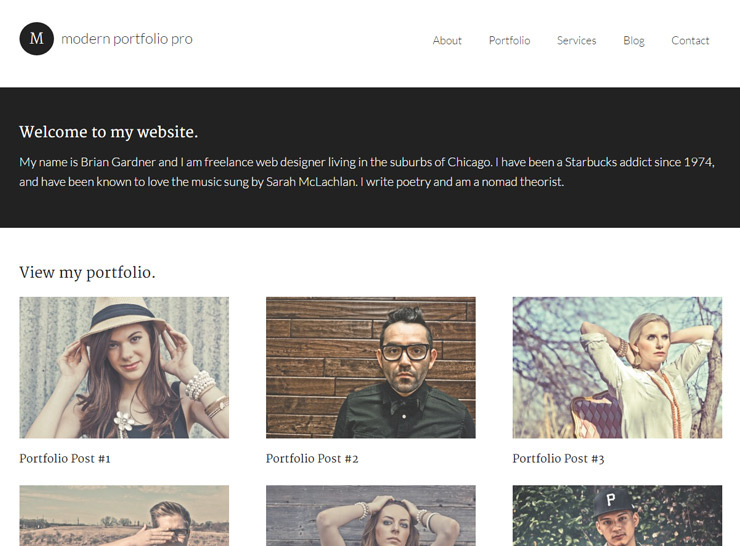 Modern Portfolio Pro is a very simple, modern one page WordPress theme that can be used to showcase your portfolio and images. Be seen, and build your brand using a professional, high-visibility design that tells your story, frames your best work, and offers the services your clients need. The design is simplistic in nature and one of the few themes you would find that does not have a large image banner or slideshow at the top of the home page. Instead the theme starts off with some welcome text, which is also excellent for search engine visibility. The theme wastes no time in getting to the point by showcasing the portfolio right after the welcome text. Each portfolio item links to its own page that has all the details about the project. A simple call to action row and latest posts from your blog finish up the simple home page layout. Main features of Modern Portfolio Pro: simplistic design, entire focus on images and content, Genesis framework, clear and modern typography, and 5 pre-built color schemes to choose from, multiple page layouts.